This morning, over breakfast, I began to think about the lyrics of Gershwin’s much-loved Summertime – ‘It’s an ironic song, right?’ And of course it is – it’s a lullaby sung by a poor southern black woman to her baby. But for many, including myself, the song has that genius quality of conjuring up both a powerful nostalgia for the season it describes and a realisation that the object of the song doesn’t actually exist. The summers of nostalgia, untrammeled by extreme heat, the threat of bushfire, insect plagues, floods, dust storms, drought … No, summers in southern Australia are never what you’d call ‘easy’. But this is not to say they don’t have their charms, some of which Andrew Lang describe below. Summer time is when we turn all the year’s work into money – or that is the hope. 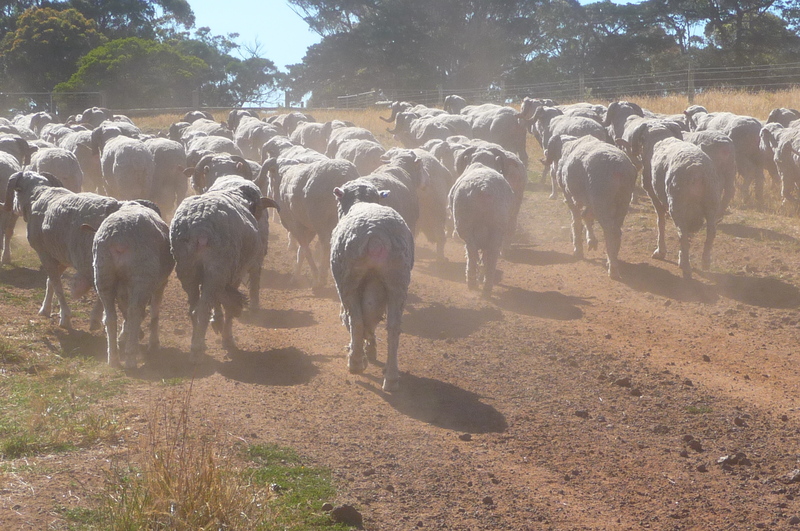 It’s a time of long hot days, clear skies and dry winds, and, while winter brings issues such as bogged vehicles, storms during lambing, intestinal worms and daggy backsides, summer is associated with flystrike and water problems, leaking troughs and sheep getting bogged in the creek. And there’s the heat and dust, the exhausted dogs and the flies. 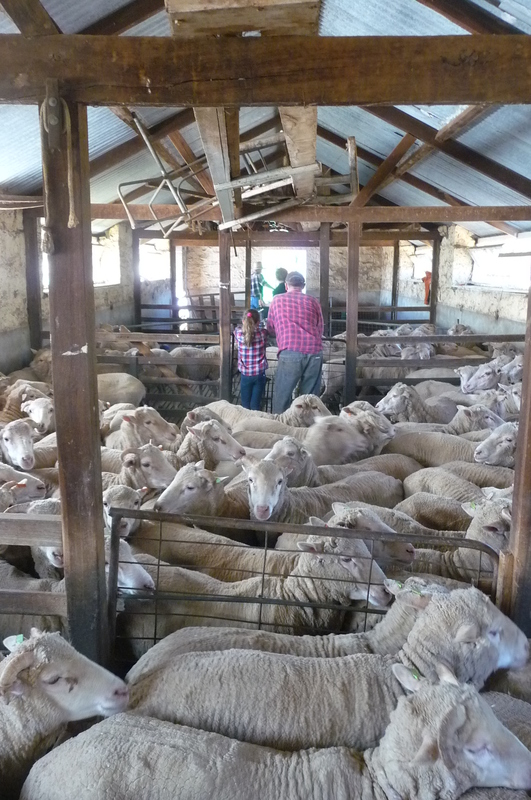 While animals tend to be generally healthier in summer (and this year, around here, there is an abundance of feed), we have to keep an eye out for weaner lambs getting vitamin A deficiency, and for flystrike – the curse of sheep farmers over the hot months. Last Monday we began dipping. 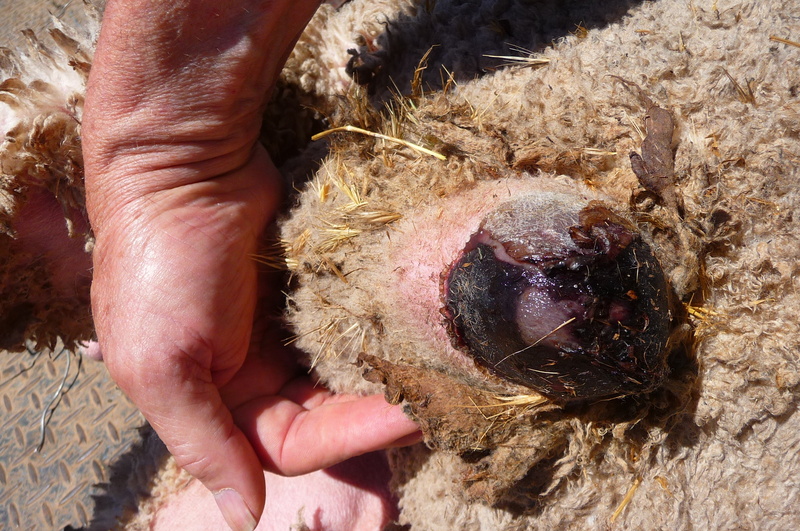 This is a process that is supposed to kill all the insects – lice, keds and ticks – that can infest sheep. If left untreated, these can render wool almost valueless, as it becomes matted or felted from the host sheep rubbing itself against a post or tree, half demented with irritation. In fact, a farmer lives in a state of constant apprehension about the build-up of the population of one sort of pest organism or another, most of which are extremely tiny or even invisible to the naked eye. Pizzle rot occurs due to the castrated male’s system not being fully able to utilise the higher levels of protein in clover, and so an excess of protein comes out in the urine flow. This attracts a certain type of bacteria which ulcerates the lining of the urethra and then, before you know it, the thing is inflamed and blocked and full of pus and looking very much like a beef olive. The only thing to do is slit the pizzle open with a sharp pocket knife. Having a pair of testicles means the protein is more fully utilised by the animal, so we can largely prevent pizzle rot by giving a steroid injection at the critical time of year. Which is another good reason for having testicles. But I’ve got distracted with talk of disease. I wanted to talk about the way the country life and the city life seem to be steadily moving further apart. 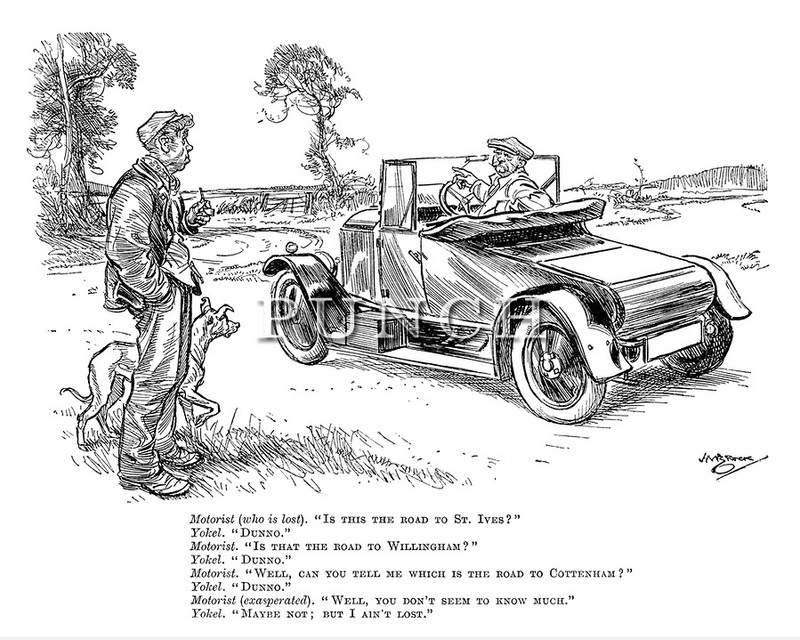 In the 1970s there was a regular strip in Punch (the British weekly magazine, now extinct) that compared two scenes, with one titled ‘In the country’ and the other ‘In the city’, illustrating a general trend of a widening difference in outlook. So it’s nothing new. But back then anyone half-alert got the joke. Now, it’s possible that this is no longer the case. The difference is stark sometimes. For example, when I am going around lambing ewes at about 7.30am and the sunlight is on the cobwebs on the grass and it is a scene of ultimate sylvan peace, and I hear on 774 ABC how the freeways into Melbourne are clogged and traffic is at a standstill. Or today, forcing rams up a raceway that’s just a bit narrower than the spread of their horns, into the dipping process, and it’s hot and the rams are uncooperative and agitated, and anyone of them could do my knees some terrible damage. And I know people in cool city offices are looking forward to their Christmas parties, Christmas bonuses, and a few weeks off. Today I drove into Camperdown to take my main dog Ronnie to the vet for an assessment of what seems like arthritis (which is not good in an 8-year-old Kelpie working dog). There are no stop lights in Camperdown and no parking meters either. I am pretty sure there is no time limit on parking anywhere along the main street. I got a park outside each place I was going to, always in the shade of Camperdown’s massive elm trees. I know the people at the vet, in the travel agency and in the National Bank. And in the supermarket and other shops they talk to me like I’m an individual and a worthwhile customer. 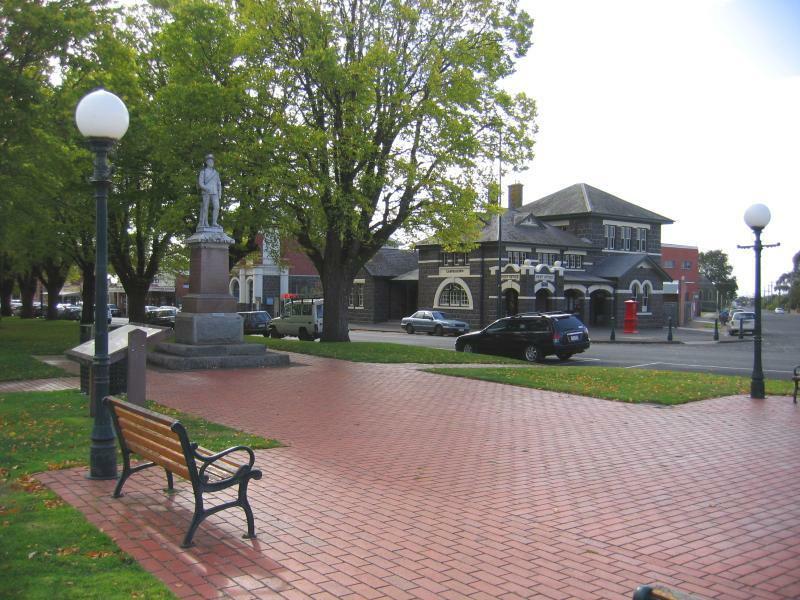 So I know that their regular town customers would be friends, or regarded as part of the overall town family (and may very well actually be related in a place like Camperdown, so you have to be pretty careful whom you badmouth to whom). Anyway, to go nowhere with all this, we do need to try to work on the reconnection of city and country and not through the route of making everything too simplified (otherwise known as The Farmer Wants a Wife or McLeod’s Daughters, A Country Practice, or some other pap. 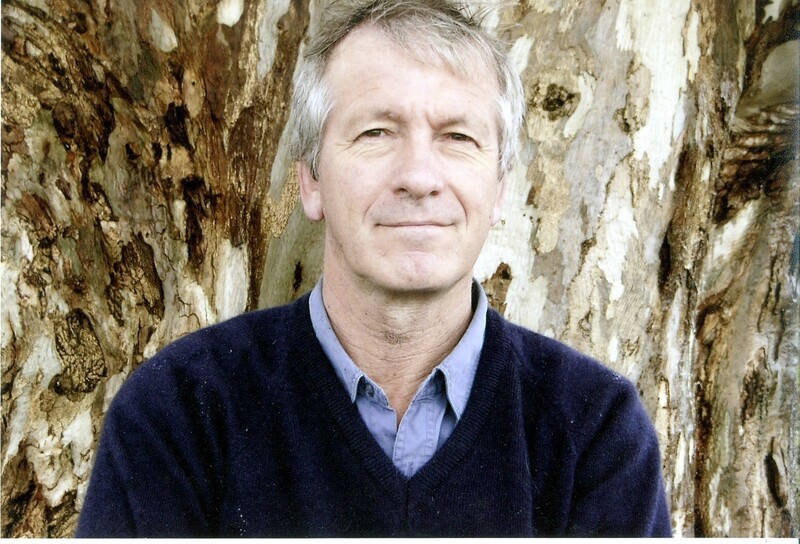 Although I didn’t actually mind A Country Practice or that other one where Rachel Ward was a vet in the back-blocks of South Australia, but maybe that was more to do with Rachel herself). And today’s highpoint, when forcing those jibbing rams up the race, was the sound of cheeping coming from above me, which slowly registered in my increasingly dehydrating brain. I looked up and, in a foot rest of the upturned rowing four on the rafters of the shed was a Willie Wagtail’s nest. Three little heads peered over the edge and three wide-open beaks emitted cheeps of hunger. Now that dipping is thankfully finished, the parents can get back to keeping up the steady supply of small flies and mosquitoes. So, today’s ‘In the country’ scene might be this nest and a mother Willie Wagtail with a beak full of insects; and perhaps the ‘In the city’ scene would be a shopping trolley with three hungry children, mouths wide open, and a mother with a handful of treats to stop the cheeping.